Fort Campbell is the nation’s premier power projection platform. Strategically located on the Tennessee-Kentucky state line, the 106,700-acre installation possesses a unique capability to deploy mission-ready contingency forces by air, rail, highway and inland waterway. 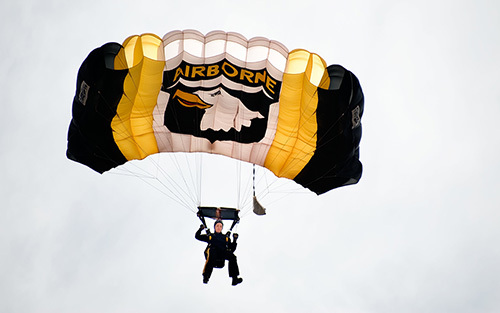 Fort Campbell is proud to be the home of the only air assault division in the world, the 101st Airborne Division (Air Assault). It is also the home of two prestigious Special Operations Command units, the 5th Special Forces Group (Airborne) and the 160th Special Operations Aviation Regiment (Airborne). Additionally, it is the home to the 86th Combat Support Hospital, the 52nd Ordnance Group (EOD), and sizable medical and dental activities. Fort Campbell provides training and mobilization support for numerous Army National Guard and Army Reserve units. Fort Campbell is an Army installation that supports active and reserve component units, Army civilians, Army Families, retirees and veterans. As home to the Army’s most-deployed contingency forces, Fort Campbell continuously refines their efforts to provide the highest standards of service and support to sustain readiness and well-being. Moreover, Fort Campbell has always been at the forefront of change and continues to be a leader in developing innovative and proactive methodologies to meet our many challenges and the needs of our customers. As Fort Campbell implements change, they are careful not to lose sight of the heritage, traditions and culture that are so important to Fort Campbell, the Army and the surrounding communities. Soldiers assigned to Fort Campbell can expect to have one of the highest quality-of-life standards in the Army. New housing, quality medical care, thriving communities, recreation and schools combine to ensure that Fort Campbell is a world-class community. Just outside the gates is Clarksville TN, the ninth fastest growing city in the country. Clarksville-Montgomery County continues to grow and adapt, becoming the state’s fifth largest city. American flags fly from many poles as a reminder of those away defending our freedoms. As Fort Campbell soldiers deploy and return from missions around the world, families, loved ones, and the community greet them warmly.